* 10 Universal spool holders. * 10 Big & Small spool caps. * 2 Horizontal spool pins. * Stable- Weighted base with 4-leg cushions. * Packed in color box. As advertised and arrived quickly and in good condition. I have made a number of purchases in the past few years and have had nothing but a good experience. The products are exactly as shown, they arrive extremely fast, and the prices are very good. I am a "shopper" and price shop for all my on-line purchases. 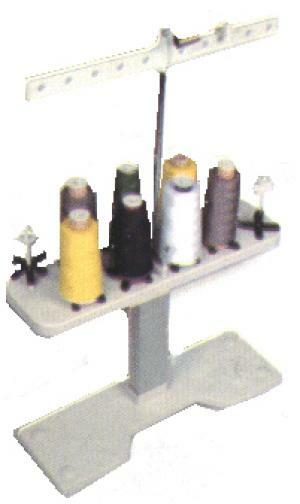 You have the best prices on embroidery stabilizer that I have found. I have and will continue to recommend you to my friends and family. Thank you for making shopping online an extremely good experience. I was happy with your product. I have been very pleased with the service I have received from Allbrands.com Will continue to do business there. Very fast shipment. Great product. Pleased, arrived on time. Just what we needed. Could not have asked for a better transaction every thing was as stated, shipment on time. Perfect in every way. The thread stand I ordered is wonderful! I love it and the price was unbeatable! Thank you! First time ordering from your company. Was pleased with the product I purchased. Will most likely purchase from here again. I just wanted to take the time to let you know I am a very satisfied customer. I really appreciate the fast shipping of my Alphasew Thread Stand and the consistent great service, prices and selection of merchandise. I will continue to order from you and I have definitely recommended you to others. Your employees were very helpful and I am very happy with my purchase. The service was wonderful! I knew just when my machine would be delivered & was kept informed every step of the way.